Welcome to the NEW Grace and Serendipity! Hi! Oh goodness, I am so excited to be writing this post! I have been re-building my website for the last two weeks, and so to be writing this to you now has me giddy! You may notice that the site has a bit of a newer and cleaner look ... and that has been very intentional on my end. I almost feel like with where things are headed, a blank slate was necessary to start from. 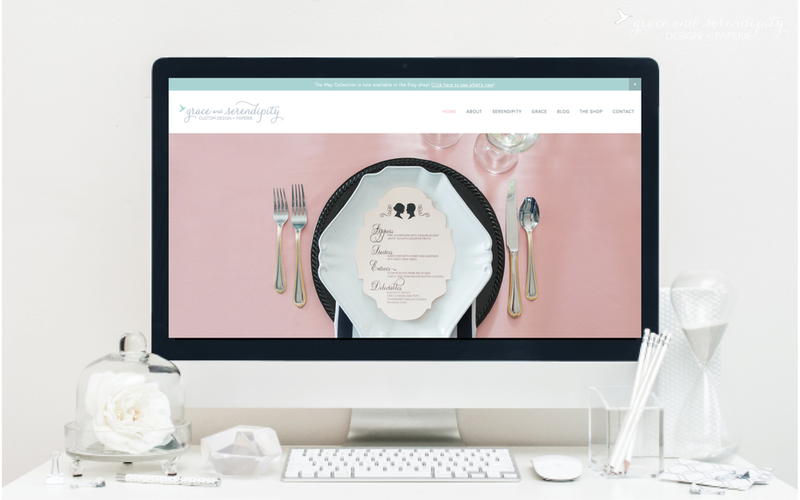 So, two weeks ago, I decided to say goodbye to my original site that has been with me since I started as a wedding planner six years ago, and build an entirely new one where I could focus more on the design side (and a few other secret not-to-be-known-yet items), and I couldn't be happier with the way it turned out! I hope that are with me on this, and that you love what you see! I still have quite a few things that I'd like to do on the back-end, mainly here within the blog pages, but for now, I think this new online home is beautiful and blends gracefully with what I had in mind. I also finally added a Portfolio page, which so many brides have asked me for recently! I love love love it. My favorite change has been the addition of the "grace" page, and renaming my design services as the "serendipity" page. Because I truly feel like this business is a fluid combination of the two ... without one being represented, my business didn't seem complete. There are SO many new and exciting things to come in the weeks ahead. I would love to send you a little note of grace to your inbox at the end of the month, when more details that I have been working on behind the scenes are put into place. This will also be the only way to receive the free monthly downloads for the month from now on. I have a beautiful set already designed for June to make up for missing this month with my site being down, so I would love to send it to you at the end of the month! I would love to sprinkle your inbox with a monthly note of grace. It'll include encouraging words for the weeks ahead, updates with Grace and Serendipity, and free wallpapers for your tech devices. Please look around the new site, and let me know what you think! I'd love to hear it in the comments below! Have a fabulous weekend, and I'll be back on Tuesday! And for those of you who want a peek at what I'll be writing out, head on over to the grace page. ;) Talk to you again soon!